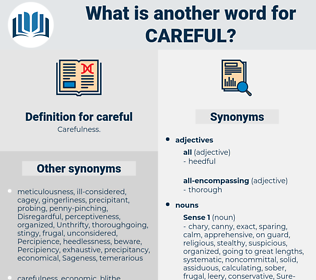 What is another word for careful? not born yesterday on lookout. meticulous, circumspect, scrupulous, thoughtful, wary, watchful, painstaking, diligent, conscientious, attentive, cautious. rigorous, observant, conservative, precise, delicate, closer, serious, sensitive, considerate, strict, discreet, well-considered, hyperconservative, exact, timid, sensible, Conservativeness, responsive, careless, cautionary, keen, inaccurate, mature, stringent, restrained, methodical, elaborate, sophisticated, exhaustive, ripe, sure, proper, conscious, reticent, faithful, conscientiously, specific, distrustful, disciplined, anxious, neat, advisable, hesitant, care-giving, tentative. considerations, precautions, minds, thoughts, cracks, Axes, whoops, Energies, women. addressed, focussed, paid, Came, pointed, Brought. inaccurate, inconsiderate, negligent, heedless, rash, inexact, questionable, indiscreet, uncareful, foolish, loose, uncaring, unscrupulous, irrational, reckless, inattentive, lax, incautious, unwise, false, thoughtless, idiotic, unconcerned. hurried, halfhearted, imprudent, undiscriminating, dull, apathetic, lackadaisical, oblivious, unguarded, unintentional, mindless, venturesome, unplanned, injudicious, undemanding, asleep, drowsy, regardless, inadvertent, indifferent, impetuous, unsafe, improvident, imprecise.
" I was most careful not to get in her way, you understand.
" 'Tain't right," old Blodgett murmured, careful not to let Captain Falk see him talking.